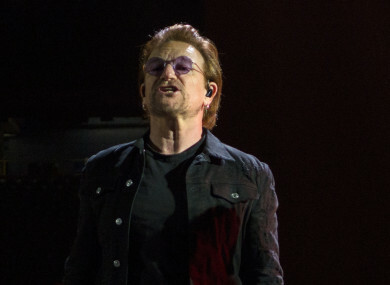 U2 during his band's Josua Tree 2017 tour. U2 FRONTMAN BONO has said he is “distressed” by leaked documents showing he invested in a Lithuanian shopping centre which may have broken tax rules, but welcomed reporting on the issue. Bono owns a stake in a Maltese company that bought the mall via a Lithuanian holding company in 2007. The enterprise, in the Lithuanian city of Utena, is now under investigation for possible tax avoidance, after it allegedly avoided paying £41,500 (€47,000) in local taxes using an unlawful accounting technique, they reported. Bono said he was “extremely distressed if even as a passive minority investor… anything less than exemplary was done with my name anywhere near it”, he said in a statement obtained by the BBC and The Guardian. The singer said he had been “assured by those running the company that it is fully tax compliant”. I would be extremely distressed if, even as a passive minority investor in UAB2 in Lithuania, anything less than exemplary was done with my name anywhere near it. I’ve been assured by those running the company that it is fully tax compliant, but if that is not the case I want to know as much as the tax office does, and so I also welcome the audit they have said they will undertake. I take this stuff very seriously. I have campaigned for the beneficial ownership of offshore companies to be made transparent. Indeed, this is why my name is on documents rather than in a trust. The fact is I welcome this reporting. It shouldn’t take leaks to understand what’s going on where. There should be public registries so that the press and public can see what governments, like Guernsey, already know. The revelations stem from a trove of documents leaked from a Bermuda-based law firm, Appleby, and reported by the US-based International Consortium of Investigative Journalists. The leak has been nicknamed the Paradise Papers. Email “'I take this stuff very seriously': Bono says he is 'extremely distressed' by Paradise Papers”. Feedback on “'I take this stuff very seriously': Bono says he is 'extremely distressed' by Paradise Papers”.